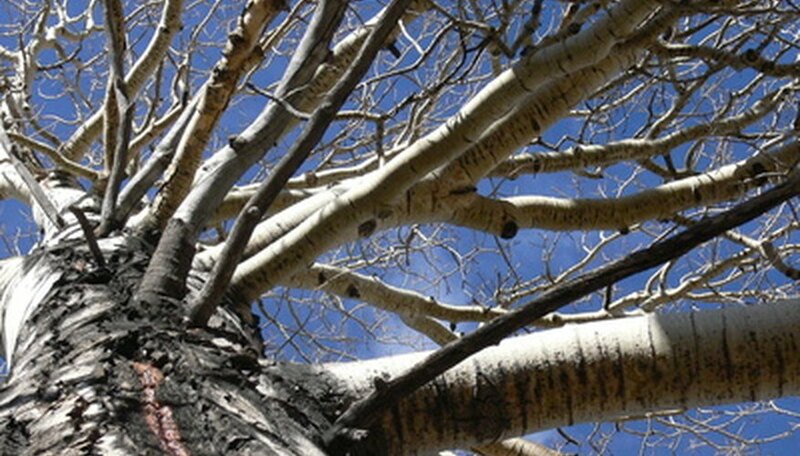 The aspen tree, commonly known as quaking aspen (Populus tremuloides), grows 40 to 70 feet high with a white trunk that spans 1 to 2 feet in diameter. These large trees, which are challenging to remove because of their large size, pose another removal challenge due to their reproduction abilities. Aspens naturally sprout to spread throughout an area quickly, especially after tree is weakened by removal. When cutting down an aspen, it's important to kill its root system or it will continue to send up sprouts. Cut down the aspen tree by making a V-shaped undercut at the tree's base with a chainsaw. Cut to only about one-third of the trunk's diameter. Make a back cut on the opposite side slightly above the V's intersection, equal in width to the undercut. Maintain a small amount of wood in the middle to create a hinge. If the tree is already removed and you are working with an old stump, make a fresh cut on the stump. Move away from the tree as it starts to fall. Apply a herbicide containing triclopyr or glyphosate to the stump's cut tissue. Follow the application directions provided with the herbicide. Cut down sprouts every time one emerges with a pair of garden shears. Spray the herbicide on the sprout's open wound.